Many of northern Michigan's highest-profile golf courses, such as Arcadia Bluffs Golf Club, Bay Harbor Golf Club and Tullymore Golf Club, are modern developments. In 1968, Robert Trent Jones Sr. designed the Heather Course, the first at Boyne Highlands. But world-class courses in this region, which is seemingly ideal for the game, are nothing new. In fact, golf has been a major draw here for more than a century. It's just that the courses from yesteryear are very different than what we see today. If you know where to look, you can sample some of the best courses, old and new, built by some of golf's most prolific architects. Golf courses in northern Michigan date back to the late 19th century. 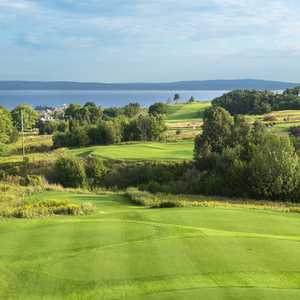 A few of these humble clubs are still around, such as Wequetonsing Golf Club, Harbor Point Golf Club and nearby Charlevoix Golf Club. On historic Mackinac Island, vacationers can still tee it up on Wawashkamo Golf Club, which dates back to 1898. Many of these early courses were founded and built by locals, but there are a few exceptions where noteworthy names left their mark in the area. Back in 1929, Alister MacKenzie and Perry Maxwell came to the northwest side of the state just a few miles from the Sleeping Bear Dunes and built Crystal Downs Country Club. Mackenzie gems are hard to come by, and those with the right member connection shouldn't miss out on one of America's finest classics. The best course from this era available to the public is located further up the coast in Charlevoix, Belvedere Golf Club. This layout was designed by Willie Watson in 1925. Watson, a Scotsman who also built such courses as Harding Park in San Francisco, delivered a course on rolling, parkland terrain that has hosted the Michigan Amateur Championship 39 times. Today, the 6,713-yard test still holds its own as one of the great must-plays in the north. Watson is less prolific than another Scottish designer, Donald Ross, whose presence is much larger around Metro Detroit than in the north. But a little slice of Ross can be found along Elk Lake north of Traverse City. 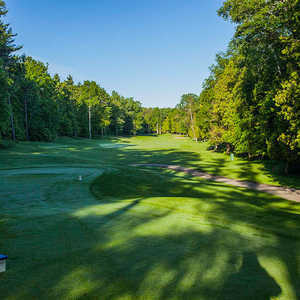 Elk Rapids Golf Course is a small nine-hole course dating back to 1923 and plays little more than 3,000 yards long, perfect for a quick after-dinner game during the long summer evenings of the north. As Ross' reputation and importance to design grew over the next few decades, Boyne Highlands Resort called on Michigan-based architect William Newcomb to build the Donald Ross Memorial Course in the 1980s, a collection of 18 of Ross' best-known holes from courses Oakland Hills, Seminole Pinehurst No. 2 and more. The big finish is a replica of The Monster's infamous, watery, par-4 16th hole. Prior to the Ross Memorial, Boyne Highlands' first course was built in 1968 at the hands of Robert Trent Jones Sr. The Heather Course helped to bridge the gap between the classic courses of the 1920s, and the modern generation followed with a mix of new and old design traits. It's gently rolling and walker-friendly (the resort even offers caddies) and has a championship yardage more than 7,100 yards, full of splashed bunkers, long forced carries and elevated greens. Soon after, northern Michigan's golf and resort development enjoyed a boom in the 1980s. In hilly Gaylord, Treetops Resort called RTJ Sr. back to Michigan to build its first golf course, The Masterpiece, which opened in 1987. Set on ground entirely too hilly and forested for traditional course design, it was the first of what would eventually be dozens of courses to be built at ski resorts on ground once thought too severe to put golf on. Jones' Masterpiece helped usher in a new breed of dramatic golf courses. Shanty Creek Resorts welcomed designs from both Arnold Palmer (The Legend) and Tom Weiskopf (Cedar River) set on around its ski-hill slopes. Treetops also unveiled its new Treetops North facility that included similarly dazzling hillside courses designed by Tom Fazio (The Premier) and Rick Smith (The Signature). The Otsego Club, known for its historic Classic Course, built a mountain stunner next to it, the Tribute, which plays every bit as undulating as nearby Treetops. 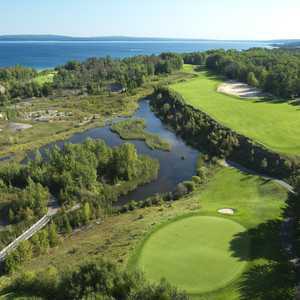 Meanwhile, in Traverse City, the Grand Traverse Resort commissioned Jack Nicklaus, still in the early stages of his design career, to build The Bear, which opened in 1984 and would become nationally recognized as one of the toughest courses in the country. Golfers from all over the Midwest sought it out to see how their game stacked up against Jack's beast with a rating/slope of 76.3/148, and the course became a regular host of the Michigan Open. While high-profile golf courses such as Arcadia Bluffs and Bay Harbor continued to put northern Michigan's golf courses near the top of Top 100 rankings, other more humbly built courses were added. Tom Doak, a champion of more minimally designed courses, built his first course, High Pointe Golf Club (currently closed) near Traverse City, in 1989. Shortly after, he built the challenging Black Forest at Wilderness Valley in Gaylord, a tough, scenic course that remains on many "best of Michigan" lists. One 21st century course that feels like its a century old already is the Kingsley Club near Traverse City. A private club offering promotional play until it fills its membership, comes full circle with Mackenzie's Crystal Downs. Architect Mike Devries, who grew up playing and working at Crystal Downs, laid out a similarly rugged and wild course using virtually no earth-shaping. The result is a course that looks decades older than its open date in 2001, full of topsy-turvy greens, dramatic, penal bunkers and fescue fairways. Devries, a former intern of Doak, designed another throwback gem in the upper peninsula, Greywalls Golf Course, which is similarly natural and rough, overlooking Lake Superior, a bit like Crystal Downs overlooks Lake Michigan.